We were planning a destination wedding and defaulted to the list of approved vendors provided by our venue. Most had mixed reviews, but Ray's quickly pulled ahead after I did my research and saw all of these wonderful reviews. Out of all the vendors we were provided with, Ray's was the only one we reached out to for the following reasons: they are incredibly responsive, their prices are very competitive, and their food is AMAZING!!! We traveled up north for our tasting and were so blown away that we gave them a deposit before we left the building. I had that fear as the wedding date approached and though to myself, " that tasting was great, but will it taste the same after the chefs multiply everything by 100? Will it become basic wedding food?" The answer was NO!! Everything at the wedding tasted just as good as it did at our tasting. The vegan option blew my mind and I almost ordered it for my own meal even though I'm not Vegan! Thanks to Dan for helping us make revision after revision helping us stick to our budget and accommodate everyone. The day of my wedding, the Ray's team arrived on time and produced an amazing spread for us. They gave us apps for just my husband, myself, and the members of the bridal party signing the marriage license, so we could enjoy a few of the apps - their crab cakes (my requested app since I grew up in MD) went so fast from that private bridal party plate that I ate one, did the marriage license signing, and looked back to find everyone else had gobbled them up! The Ray's team offered to bring me more (they were so accommodating) too! For dinner, my coordinator had sped up the timeline slightly, which meant that Ray's had to get everything ready to go a little early - since the goal of food prep is to have it as hot and fresh at exactly the right time, this speeding up meant a little of a rush for the kitchen, but they did a wonderful job and had properly temperature, fresh, delicious food ready for everyone before the tables were called (so challenging to do when the timeline gets rushed). My husband and I got our dinner first (we did buffet style service) and really enjoyed everything - so much so that my poor hungry husband wouldn't let us go around to visit the guest tables during dinner because he was so busy eating! We received so many compliments on our dinner and desserts - and also on the staff! Ray's staff were all so friendly and really made our wedding feel like the backyard whimsical garden party we were hoping for! I would highly recommend Ray's Catering to anyone looking for a high quality caterer at a reasonable price point in the Marin Co. area! We just came back from our wedding, and we were really happy with our choice of Ray's Catering. Our wedding was at a venue with some unique needs (San Francisco Theological Seminary), and Ray's had no problems setting up and working there. Our contact, Dan, was always very responsive and willing to work with our needs and limited budget. He went out of his way to accommodate our guests with a number of allergies. I had forgotten to communicate some pretty important information regarding our wedding layout to them and found out only a couple days before the wedding, but Dan made us feel very at ease and everything went off perfectly. The staff were all very friendly- a bartender that took beer bottle caps off with his wedding ring made a big impression on our guests! The food, heavy appetizers was filling and yummy, especially the mini empanadas. We highly recommend Ray's Catering. Working with Ray's Catering to cater our wedding was the BEST decision that we could have made! 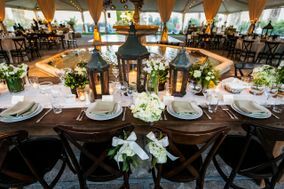 We had Ray's take care of our table and chair rentals as well as our tent and lighting and heating which made everything so easy! One Bill! Kelly was fabulous to work with from day 1 and we are so fortunate to have had her the night of our wedding coordinating all of the food, and other vendors as well. She was so accommodating to our wedding guests and to my husband and I the day of our wedding. She and the other Ray's servers provided us with our own plate of appetizers during cocktail hour (which was when we were taking photos) and took care of us all night, checking in to see if we needed anything. We still have guests talking about the food, and the service!! Amazing! Without a doubt, would HIGHLY recommend Ray's Catering to anyone looking for fabulous food, and a truly amazing stress-free wedding day! Thank you SO much Kelly & the rest of Ray's Catering! Thank you so much for letting Ray's Catering be a part of your special day! It was truly a pleasure to work with you! Rays catering was very easy to work with and their food was wonderful - we are still getting comments about how good the food was. They can arrange for table and linen rentals if needed, and can also set it all up. On the day of, they were timely, pleasant, and cleaned up after themselves wonderfully. If you are looking for a good caterer, do yourself a favor and give Ray's a call. Did a beautiful job setting up and arranging a delicious meal for our wedding guests! Everyone complimented how great it was! Thank you! Excellent Catering Services. I would highly recommend. Roger and Cidra are the owners, with Natalie managing many of the details. They were fantastic. Our wedding and all the details were carried off without any glitches. If there were any on the day of the wedding, they were handled by the caterers in a transparent manner. The day after the wedding, they came to clean up at our family's estate first thing in the morning with their crew and left things in perfect condition. Beautiful job from start to finish. The food was tremendous, lots of rave reviews from the guests. We chose them from personal experience and reputation. They are worth every penny. I have been told by multiple people they have never had good steak at a wedding. But our wedding proved them wrong! All of our food-snob guests loved the food. We worked with Dan to come up with a great menu. We loved the bar and champagne tower. And our donut buffet at the end couldn’t have been a bigger hit! There was a little miscommunication about the rentals and permits we needed between them and our venue, but everything got sorted out nicely in the end.